Whether you are looking for a gazebo to set in your lawn or attach to your patio, you’ve found the right place!! With Luxcraft gazebos, our goal is quality. 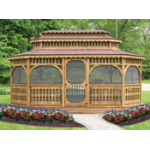 All our gazebos are custom made from kiln-dried and treated, select-grade lumber. After receiving the lumber, Luxcraft air dries it for five to six months before using it to eliminate shrinkage, warping, and checking. Once the lumber is ready to be used, they hand select it for appearance and quality. 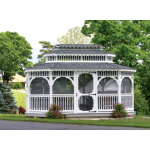 Gazebos are assembled with stainless steel screws and vinyl gazebos are reinforced for structural strength. 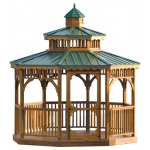 Most of our gazebos are pre-built in Luxcraft’s shop, but they are also available to be constructed on-site or in a kit form. 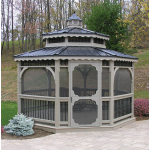 In-stock gazebos are wrapped with heavy-duty plastic for protection against weathering. Gazebos are available with numerous options and styles to choose from; we are confident you will not be disappointed. Choose from over ten different panal styles and dozens of options to fit your need, style, and location. 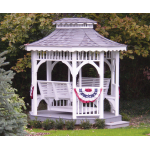 Maintenance-free vinyl gazebos are available in white, ivory, or clay. 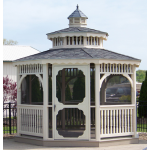 Wood gazebos can be painted white or treated in five different stain colors. Vinyl poolhouses are a great addition to set beside your pool or in your backyard. The enclosed are is a place for storage. House your hot tub in the deck are and enclose It with screening to protect yourself from the pesky flies and bugs.